If you want to attract the right candidate, usually hard to get candidates, you’ll have to do more than setting up branded job sites with “feel good” content. All big brands have deployed employer branding initiatives to attract talent. These initiatives are usually translate into branded job sites, and hiring campaigns. These sites contain content in which employees who reflect on the company culture, job content and employee satisfaction related aspects. The problem with these sites is that they are HR initiatives. The problem is that future employees only visit these sites when they are already thinking of joining the company. The problem is that hard to get employees, who are not looking for a job, are not visiting these sites, and never will visit these sites. Hard to get employees go through an awareness phase in which they slowly develop a preference for certain brands. I am a nerd. A marketing nerd. And I am proud of that. To me, everyone passionate about a certain domain is a nerd. And that’s fine. And as nerds like to do, nerds connect with likeminded people. Fellow nerds. They do that offline, by visiting conferences, and they do that online, by connecting to the same social networks as their fellow nerds. And when employees, working for your brand, connect with people working for your customers, they do that because they are peers. They trust each other, because they talk the same language, and have the same interests. The problem with employer branding is that it works towards people who already found your brand, and are looking into your brand. your employees are connected with employees of your customers. these employees might become your employees one day, or influence other people within their social networks. 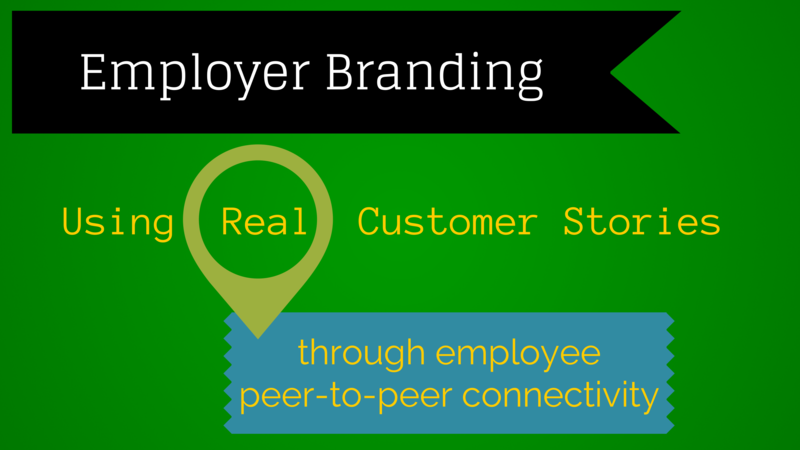 through peer-to-peer content, future employees become aware of your employer brand. when the time is right, they know about your employer brand, they know people within your brand, they trust your brand, and as such will be more inclined to join your brand as an employee. This can only be accomplished by activating your employees to tell your employer story through real and authentic stories that are build to appeal your… current customers. Your employer brand should not be told on branded and corporate job sites with “feel good” stories about how nice it is to work for the brand. It must be reflected and shown in the genuine content your give to your customers. Because your future employees are either working for your current customers, or are connected through social networks with your employees. Only this way you get an authentic image, which is real at the same time. Employer brands of tomorrow are communicating THROUGH their employees, using stories that appeal CUSTOMERS and FUTURE employees. Really curious about what you think of this one. Leave your comments in the comment box below. You can also follow me on Twitter, LinkedIn, Google+ or Facebook.